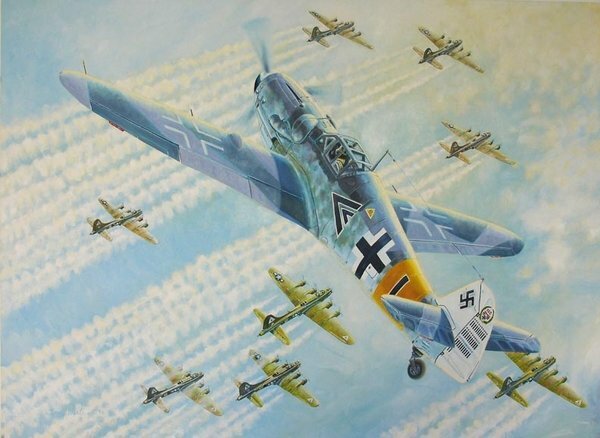 Overall print size: 22" x 28"
Major Anton Hackl banks his Messerschmitt Bf 109G-6 over a formation of American B-17s from the 381st Bomb Group. Major Hackl of III./JG-11 was credited with a total of 192 confirmed victories, 34 of which were 4-engine bombers. On January 11, 1944, the 381st BG lost eight B-17s on a mission to Oschersleben where they encountered great opposition from the Luftwaffe.